Ready for some camping fun this year? 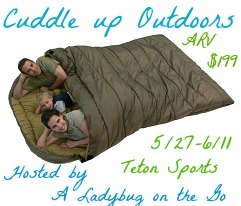 The Cuddle up Outdoors is an awesome giveaway event for our camping fans! Enter to win this huge Mammoth Sleeping Bag below! Good luck everyone! This has quilting throughout and “cushioning around zipper and shoulder to keeps drafts out”. Built for two or more people it has three sided zippering for easy access from either side. This is roughly the size of a queen mattress so you can even fit the little ones if you want! Best of all there is a Oxford Compression Sack with Drawstring Closure to hold the sleeping back when not in use! The “mummy style” hood holds pillows in place as you sleep! Teton Sports “was started in 2005 in Utah with a very long not-to-do list as opposed to the traditional to-do list. We do just a few things, but we try hard to do them well.” Their short but great list of products include sleeping bags, tents, bags/backpacks, cots, and a variety of accessories. Enter to win via the form below. Giveaway ends June 11, 2013 at 11:59 pm EST. Giveaway is open to the Continental US. This would be awesome. My sister has a park model at Woodsmoke Ranch in Seneca IL.We go out there for all the holidays during the summer and then in October we go out for the Haunted house and its always cold. I would love to use this in October.We sit around the fire and drink hot cider. I would love to have on of these for those nights that we go out in the summer to watch the meteor showers. This would totally solve our problem of not being able to sleep in the same sleeping bag! We go camping in the Rockies a bunch every year so this would be awesome! Plus we are expecting and due in September so next year we could all three cuddle up in it! I would use this at the kings dominion campsite this summer! cant wait to go! I would use it for when we go to the lake. I would use this when we go camping at Bodega Bay over the summer. I would totally use this sleeping bag for my boys the next time we go camping. In NJ or NY. We would use this camping this summer. My daughter would love to camp in the backyard with her friends in her daddy’s tent. We would probably use this in our family room for a “sleepover” first. My daughter is learning about camping at preschool & has been wanting a sleeping bag! Excellent giveaway!! Would be perfect for our family camping trips. Thank you for the chance to win something awesome and useful!! I would use this for my first camping trip with my 2 young Grandsons aged 2 & 4. So excited to take them camping! I’ll give it to my Grandsons and they will use it in our backyard. I will use it first during an upcoming camping trip in Alaska. This is a great idea….I feel claustrophobic in many sleeping bags. We’re going camping and boating with my mom the second week in July so (if I got it in time) this would be where I’d break it in! This would be great for using at the beach for overnight camping trips! I’d use it in the back bedroom (we have no furniture in there). I would fold it in half and sleep on it so my hubby will quit complaining that my snoring wakes him up. I would love to use this on our first camping trip as a family this summer! Will use it on our next camping trip to the mountains! I would use this for out in our yard to star gaze with the kids on chilly nights & also for camping. We plan to take a trip to western new york soon, a sleeping bag would be great- it’s a handy backup in case the hotels are too expensive. We’d use this on the camping trip to FL we’re currently planning. I would use this at my parents cabin. I would use this to go camping with my family at the state park and cuddle up on a cool evening near the campfire. I’m a girl scout leader for my Daughter & this would be perfect for her & I to share when we start camping! OOo! I want to use this to camp up near the Blue Ridge Mountains. So cozy! I really don’t know where I would use this first if I win, but I would most certainly use it at some point! Thank you. We go camping all of the time, the next trip we have planned is to Colorado and it would get used there. I would use this when we go camping in Maine. Thanks for the chance. I would use this during the winter when the temps are freezing!! just for general everyday use inside the house, lol! It would be used every time my granddaughters stay overnight at my house. they like to do exciting things and they would camp in most of the rooms of my house! We would use it for camping this summer. I plan to go camping at the outer banks! and this would be a great addition to the campsite! i have 4 kids plus 2 stepkids…..so it would get used alot lol…..it would probably just be used at home first….but i’d love it for camp 🙂 and for the drive ins it would be awesome!!!! I want to win this for me and my kids 6 most boys we have a big yard and want to camp in it!!!! This would even be great for when the kids have friends stay over. Perfect for camping up in the mountains. This would be fun to use in the backyard with my husband or for movie night in the living room with my boys. Of course, we would also take this on our camping trips too! I’ve been planning a camping trip and winning this would be the perfect excuse to pitch a tent. id use this for camping with my hubby at our fav conservation area! This would be great because once the baby is born, we want to be able to start taking our kids camping, and this would be a wonderful addition to our gear. My son would enjoy this when he goes out to watch meteor showers. …use it camping this summer !